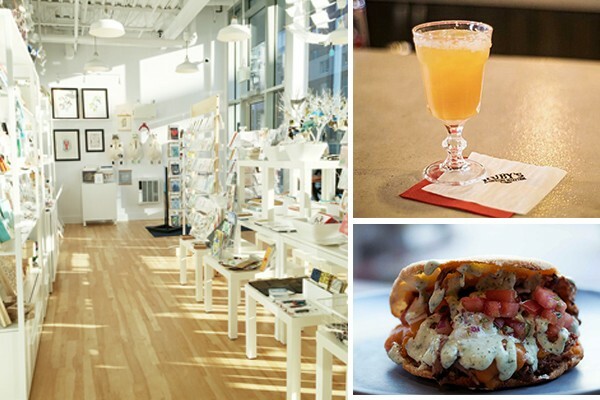 Halifax’s centre may be a political and business capital, but it’s also an inviting place for the rest of us, with great boutiques and unforgettable eating to discover. The crisp white walls house everything you've needed to say but have never had the words for before now. Whether you're from the East Coast or beyond, the cards at Inkwell Modern Handmade Boutique are relatable but with a quirky, you-never-would-have-thought-of-it-yourself, twist. If you're a Haligonian, you'll recognize Inkwell by its 97-year-old working press which creates their Inkwell Originals. Out of towners: It's a must-see while you're visiting the area, and trust us, you'll be taking home a true Maritime souvenir. Inkwell carries a variety of over 200 independent artisans originating in Nova Scotia along with further corners of Canada as well as around the globe. Now with their addition of pantry food items, you can pair your card design with a treat for the special occasion or just some authentic Canadian maple syrup for yourself. Inkwell Originals' unique flair is expanding into other sectors of Halifax, and in other cities as far away Ottawa and Vermont. But even with this growing list, they never lose their neighbourhood feel. Friends and frames—isn't that all we ever need? The Ocean Optometry team started with a desire to work alongside their friends, and together they combined their knowledge to bring us the best (and most fashionable) care. We've entrusted our friends at Ocean Optometry to always tell us what's in style, and recently they've incorporated a new collection from LA-based designer Blake Kuwahara. His frames take heartbreakingly chic to a new level with his subtly obvious edge. You'll want to show off their sleek simplicity the second you walk out their door. At Ocean Optometry, they teeter the border between art and science with their fashion-forward angle to eye care. But who says you can't be both? In their care, you can have your cake and be able to see it, too. Strawberry buns, salted-caramel brownie cheesecake or coconut cream pie eclairs: It's not a satisfying morning until you've picked up your treat from The Old Apothecary Bakery & Cafe. The sugar high is just the frosting on the cake that is the decadent baked goods, but the real kick is that everything is made fresh in-house. No need to feel guilty—it's all fresh ingredients in these pastries. Dine in or take it on the go—the products travel well and make for a great walk-to-work snack. Their savoury is just as tempting as the sweet, especially when we're talking breakfast biscuits topped with homemade mayo and micro greens. Can't you already taste that flaky goodness? The Old Apothecary is a carb-lover's dream come true. With the smell of freshly baked bread filling the air, you won't be able to resist taking some home for the whole family. Where can you go for an equally delicious breakfast or a fine whiskey sour? Only at Ruby's Rhinestone Reception & Lounge can you experience a little country flair in the HRM. Breakfast at Ruby's means southern buttermilk breakfast biscuits, and lunch is begging you to try their tender fried chicken. Ruby's chefs are always experimenting and refining versions of classic homestyle foods. They take a little bit of history and bring it to 2018, even their atmosphere brings you back to the 1920s, right down to the historic building. Their bar is built around a massive bank vault where you can put your elbows up and choose between the finest whiskies Halifax has to offer. Whether it's a ladies' night out or your next date night, come hungry or come for the joy of country music. Ruby's has live music every Friday and Saturday, and the best of country every other night. Looking at their menu, you'll only read the best natural ingredients. And speaking with the staff, you'll only receive the best service. At Verano Food Purveyors, they take pride in offering the premium on all fronts. With quality this good, you can taste it the minute you walk through the doors. You can experience a different food journey each time you visit, and still the taste never wavers. Their authentic blend of Venezuelan and Mexican flavours will make your mouth water. Between the arepa with chicken, Cuban sandwich,or handmade soups, you can go in at any time of the day and leave satisfied (and wanting to come back for multiple meals). Verano's commitment to their customers is "a smile with every bite" and it's hard to decide which makes you smile more: The food or the service. Their staff is some of the best in the HRM, constantly serving downtown wanderers with pleasure and, of course, a smile.